Here’s a nice thing to show the literary jerks who turn their nose up at books by women for reasons unbeknownst: this year, fifteen out of the twenty finalists for the National Book Award are women. Beginning with over 1,500 books, the list has been winnowed down to a handful of the best and the brightest across four different categories: fiction, non-fiction, poetry, and young people’s fiction. While it’s thrilling and not entirely unsurprising to see the young people’s fiction category dominated completely by women, it’s truly lovely to see a diversity of voices represented in the fiction category. Lisa Ko’s The Leavers explores the oft-unexamined life of undocumented Chinese immigrants, through the story of a mother and the son she had to leave behind. In Sing, Unburied, Sing, Jesmyn Ward brings us back to the fictional bayou town of Bois Sauvage. 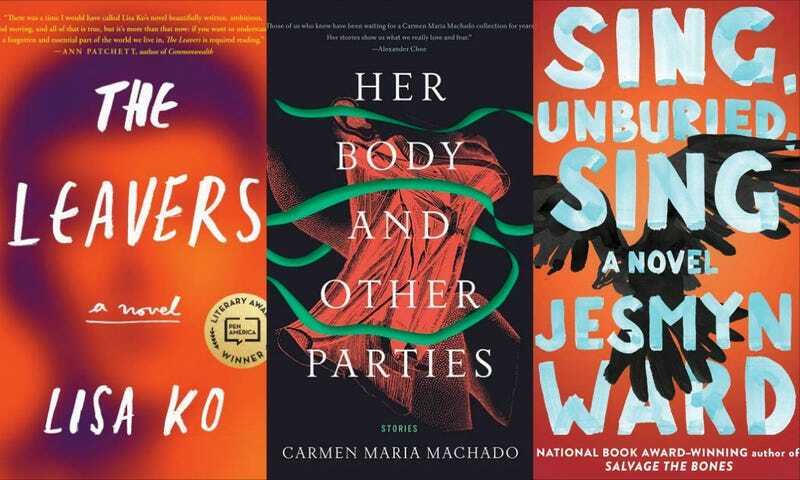 Carmen Maria Machado’s short story collection, Her Body and Other Parties: Stories, is one of the strongest debuts in recent memory, a collection of myths and fables, like Angela Carter or Kelly Link for current times. Min Jin Lee’s Pachinko is a sprawling, intergenerational saga of a Korean family living in 20th century Japan. Finally, the lone man Elliot Ackerman’s Dark at the Crossing tackles current events through the lens of fiction—one Iraqi-born US citizen who wants to join the fight against Bashar al-Assad. The National Book Award’s 2017 5 Under 35 honorees, announced last week reflected a similar diversity of voices and experiences, and was a list comprised of all women, to boot. The art of serious Fiction has been in the sweaty, white hands of the Jonathans Safran Foer and Lethem, Michael Chabon, etc., for far too long. Their grip is slipping; their time is coming to an end. The rest of this year’s winners will be announced on November 15 in New York City. Read the full shortlist at NPR.